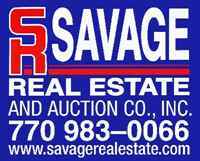 Pre Licensing - This is a 75 hour course that is onsite here at Savage Real Estate & Auction Co., Inc. 75 hours are mandated by the State of Georgia. Also during the 75 hours you are required to maintain a 75 or higher average to be able to take the final of the class. At the end of the class you must make a 75 or higher on your final to be able to take the state test that is administered by AMP. Pricing - Pre License Course fee is $475.00 if by Check or Cash and $495.00 if by Credit Card. The fee includes all handouts, work book and main material book. Education - Our next Pre License Course Class will start in Fall of 2019*. Times are Tuesday and Thursday evenings from 6:00 PM till 9:15 PM*. We will have no class on Thanksgiving day. We will also be out for Christmas break. Make sure you keep checking our website for any changes.